Swedish Glace Soy Dairy Free Vanilla ice cream. Wonderfully smooth and made with soy, our delicious dairy-free vanilla ice cream never fails to hit the sweet spot. Dairy free and lactose free. Gluten free. Vegan. Kosher certified. 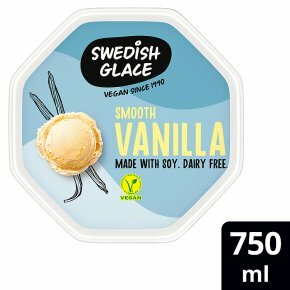 Swedish Glace Soy Dairy Free Vanilla ice cream, 750ml. A non-dairy frozen dessert, Swedish Glace is the perfect sweet treat for those who may be lactose or gluten intolerant. Gluten-free, lactose-free and Kosher-approved, it is also suitable for both vegetarians and vegans. At Swedish Glace, we are passionate about producing delicious ice cream for people who are dairy-free and don?t want to compromise on taste. We?re as passionate about wellbeing as we are about ice cream and we know that many of you choose to follow a dairy-free diet, whether you are adopting a vegan lifestyle, or are intolerant to dairy, lactose or gluten. That?s why our products have always been vegan-friendly, and free from dairy, lactose and gluten. That?s why our products have always been vegan-friendly, and free from dairy, lactose and gluten. Free from any animal products, our ice cream?s not only animal friendly, it?s suitable for vegetarians and vegans too. We ditched the dairy and laid off the lactose in making each delicious scoop of Swedish Glace. It?s perfect for people who are dairy or lactose intolerant. Free from gluten, people who are gluten intolerant or coeliac can enjoy our tasty ice cream, worry free., and free from dairy, lactose and gluten.